Information For Seniors about Housing for seniors and useful information about pensions, benefits, retirement homes, market seniors condos. The Canada Pension Plan is financed through contributions from employees, employers and self-employed persons, as well as investment earnings from the Canada Pension Plan Fund. Any person who has made contributions to the CPP is eligible to receive a monthly retirement pension at any time after the contributor's 60th birthday. However, for a retirement pension to be paid prior to age 65, the contributor must have substantially ceased to be engaged in paid employment or self-employment. The retirement pension payable to a person at age 65 is a monthly benefit equal to 25 percent of a contributor's average monthly pensionable earnings during the contributory period. The maximum pensionable earnings is set to the average industrial wage ($46,300 per year in 2009). Persons who continue to work and make contributions to the CPP after age 65 may substitute periods of pensionable earnings after 65 for periods before age 65 when they had low or zero earnings. An individual who starts to receive his or her CPP Benefits at the traditional retirement age of 65 is eligible for a maximum CPP Pension of $908.75 per month (or $10,905 per year) in 2009. The maximum applies to individuals who had incomes near or above the maximum pensionable earnings for a substantial portion of the contributory period. A simple formula determines how the benefit changes should the recipient choose to start the CPP Pension before age 65 or wait until after age 65. The amount of a retirement pension starting before age 65 reduces by 0.5 percent for each month between the date the pension commences and the date of the contributor's 65th birthday. Similarly, a pension beginning after age 65 increases by 0.5 percent for each month between the 65th birthday and the month for which the first payment is made. The maximum upward or downward adjustment is 30 percent. Old Age Security or OAS is a social insurance program that provides a basic level of pension income, on application, to anyone age 65 or over who meets residence requirements. OAS is financed from the general tax revenues of the Federal Government. All benefits under OAS are adjusted quarterly each year in line with rises in the cost of living as measured by the Consumer Price Index. 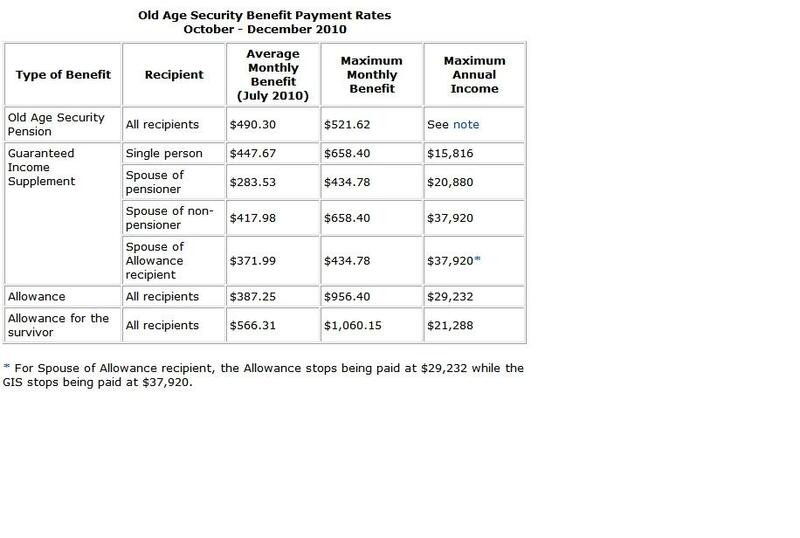 The OAS pension effective January 2009 is $516.96 per month (or $6,204 per year). The income from OAS is taxable. The amount of a person's pension is determined by how long he or she has lived in Canada. A person who has lived in Canada, after reaching age 18, for periods that total at least 40 years will qualify for a full OAS pension. A person who cannot meet the requirements for the full OAS pension may qualify for a partial pension. A partial pension is earned at the rate of 1/40th of the full monthly pension for each complete year of residence in Canada after reaching age 18. GIS is provided on top of the Old Age Security for those who qualify. Retirement homes are privately owned rental accommodations for seniors who are able to manage and pay for their own care. Generally, retirement homes are designed for seniors who need minimal to moderate support with their daily living activities. These settings enable residents to live as independently as possible, while providing certain services and social activities. Retirement homes are also called "retirement residences". Anyone can apply to a retirement home. You do not need to provide medical evidence that you need a minimum level of care. The retirement home, however, may assess your needs to ensure that it can provide you with appropriate support, or that you do not need more support than it can provide. Since retirement homes are not subsidized by the government, you would be responsible for the entire cost of both your accommodation and care. Typically, retirement homes offer packages that include accommodation and services. Fees can range from approximately $1500 to $5000 per month for a private room. You may arrange to purchase additional services or higher levels of service. Retirement homes offer considerable flexibility. For example, you can often choose to opt in or out of meal plans and/or other services. You may also leave for extended periods of time -- such as for a vacation -- and retain your residence, as long as you continue to pay your rent and any associated service fees. However, if you are hospitalized indefinitely or you decide to move, you must give written notice prior to leaving your accommodation in accordance with the Tenant Protection Act. Long-term care homes are designed for people who require the availability of 24-hour nursing care and supervision within a secure setting. In general, long-term care homes offer higher levels of personal care and support than those typically offered by either retirement homes or supportive housing. Nursing homes are usually operated by private corporations. Municipal homes for the aged are owned by municipal councils. Many municipalities are required to build a home for the aged in their area, either on their own or in partnership with a neighbouring municipality. Charitable homes are usually owned by non-profit corporations, such as faith, community, ethnic or cultural groups. The Ministry of Health and Long-Term Care (MOHLTC) provides funding for homes. 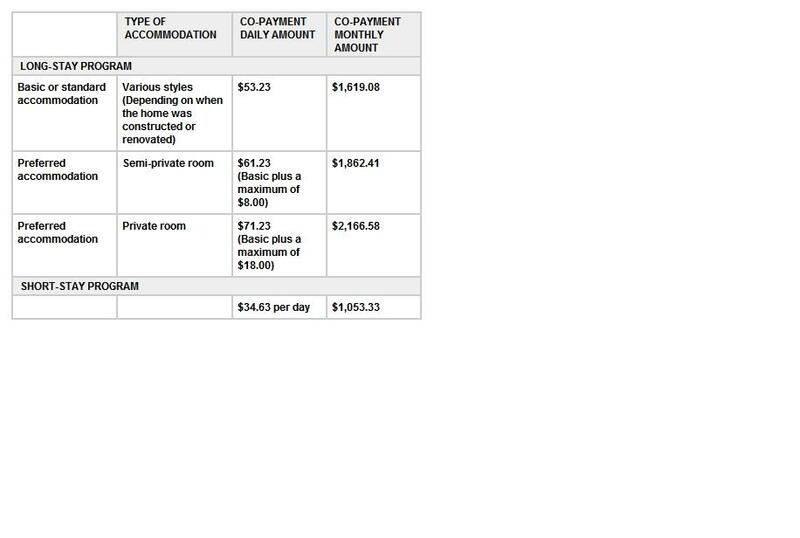 The amount paid by residents for their accommodation is called a "co-payment". Long Stay refers to accommodations that are obtained for an indefinite period of time. The short-stay respite service provides a caregiver with a break from caregiving duties. The supportive care service provides the resident support to regain strengthand confidence, usually following a stay in a hosptial. The MOHLTC sets accommodation co-payment rates. The following table shows resident co-payment rates effective July 1, 2010. The co-payment rates change from time to time (at a minimum, annually). For the most up-to-date rates, contact the staff at your local Community Care Access Centre. 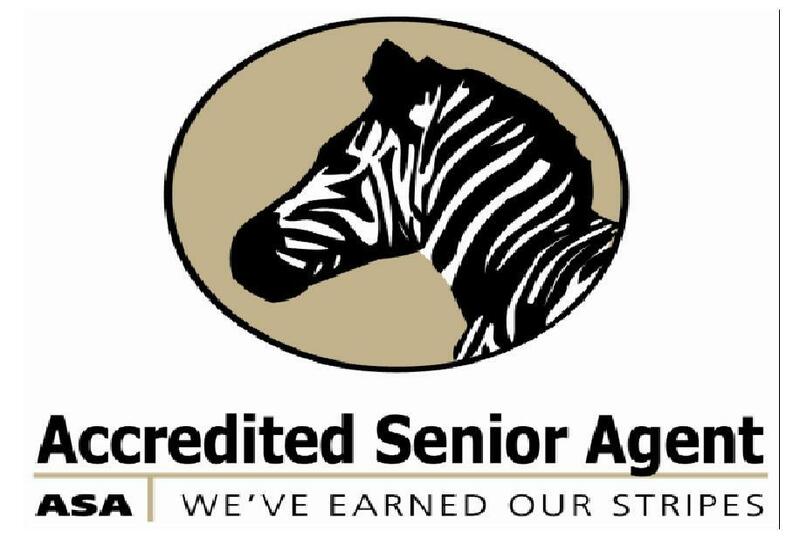 I have received the Real Estate Academy designation ASA, which stands for Accredited Senior Agent. When it is time to move out of the 4 bedroom home into a more manageable living arrangement I can help with all aspects of the transition: exploring the different choices of accomodation, downsizing, packing, tax planning, retirement planning and estate planning. I have a trusted circle of professionals who will help to safely guide you through this new beginning. My Team can help. The professional training and education I received earning the ASA allows me to represent sellers and buyers who need someone who understands their special interests. There are 323 Seniors Housing communities in Toronto. Click below to view these facilities. Click on Image For Information on City of Toronto Assitance of up to $3500 to make your home more senior friendly.